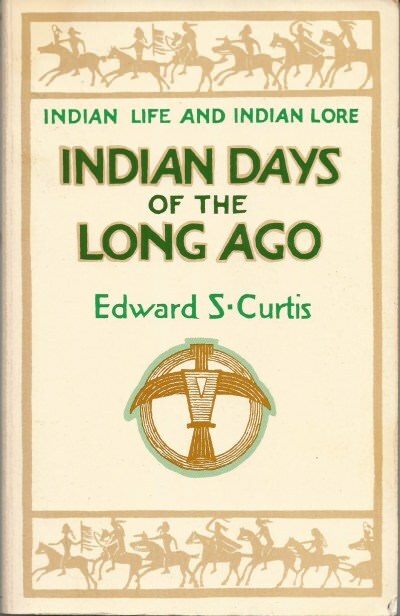 Indian Days of the Long Ago by Edward S. Curtis. The camp of Lone Pine, chief of the Salish, or Flatheads, was onithe banks of the Red Willow River, 'a beautiful stream ﬂowing through the forests of the Bitterroot Mountains, in what we now call western Montana. Its cold, trans lucent waters come from the springs and snows far up among the mountain crags. Beautiful lodges or tepees made from the dressed Skins of buffalo and elk were scattered everywhere among the pines. The village was like the camps of hundreds of other Indian chiefs or head men, which stood beside the forest stream, by the quiet brook of the open plain, by the lake in the mountains, or on the grassy bank of the prairie lake. What a great little book. Above the title it says "Indian Life and Indian Lore".. and that's exactly what it was. Most of the book is "stories" told by a visiting Indian about life in other tribes that they had never heard of. And the Lore that goes with their beliefs back then. It is a small part of children coming of age and how they learned to understand the beliefs of their tribe, and some of what life is like "in other parts of the country". Like I said, it is a small book, a quick read, and a little more understanding of what it was like to live back "in the time" before white man destroyed their way of life. 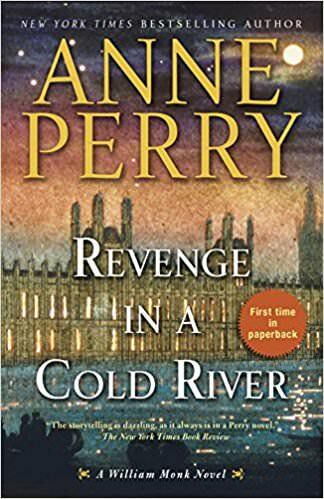 Revenge in a Cold River by Anne Perry. As many books as Anne Perry has written, this is the first one I have read. As most know, Iike books that take place in Victorian England, so it fills the bill in that respect. I thought the beginning was a little slow, but.. once it picked up it really moved right along! I did enjoy the book enough so that I have put another of her books on my wish list. I liked the main character of Monk and the twist she has on him of having a loss of memory, so that he doesn't realize why McNab seems to hate him so much. The book has twists and turns and things you think you know ...you don't really know. It kept me reading for sure. I was excited about this book since the review sounded so good to me. The first half of the book was slow and although it was setting things up I almost let it go. But I am glad I did not! The second half of the book flew by! It was very good! (Albeit somewhat sad) Some small parts reminded me of myself.. not knowing my father etc. Sort of a sad ending, but it did tie up all the loose ends. It's hard for me to say if you would like it or not. Cal McGill is a unique investigator and oceanographer who uses his expertise to locate things—and sometimes people—lost or missing at sea. His expertise could unravel the haunting mystery of why, 26 years ago on a remote Scottish beach, Megan Bates strode out into the cold ocean and let the waves wash her away. Megan's daughter, Violet Wells, was abandoned as a baby on the steps of a local hospital just hours before. 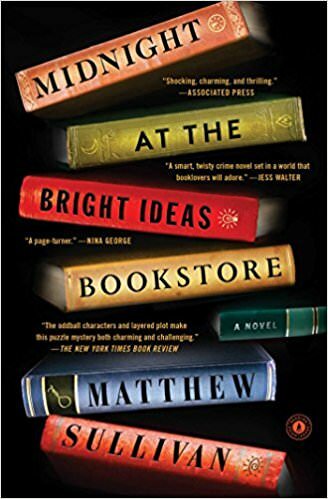 As McGill is drawn into Violet's search for the truth, he encounters a coastal community divided by obsession and grief, and united only by a conviction that its secrets should stay buried. Having read the first book called, The Sea Detective, and having enjoyed it, I thought I'd give book 2 a shot. I was about 130 pages into this one when things were beginning to sound awfully familiar... I read on 50 more pages. Now I felt sure I either read this before OR there are other books with a bunch of similarities . 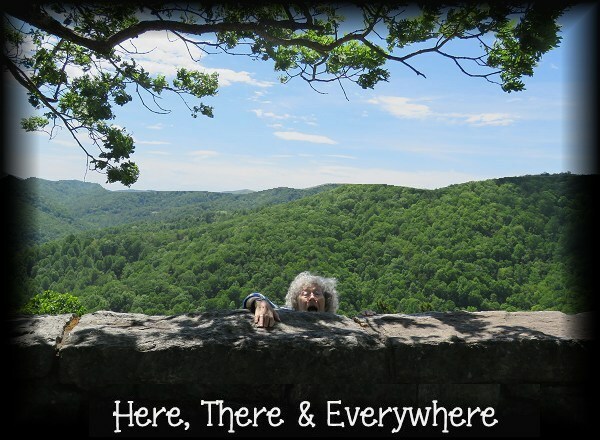 So I donned my detective cowboy hat and dug into my blog... and low and behold ! I HAD read this book 1 12 yrs ago!..and I enjoyed it! Of course that should surprise me since when I read the review from back then .. I enjoyed it! duh. So knowing I read this I contemplated ... do I read it again? Or do I put it down and begin another book? 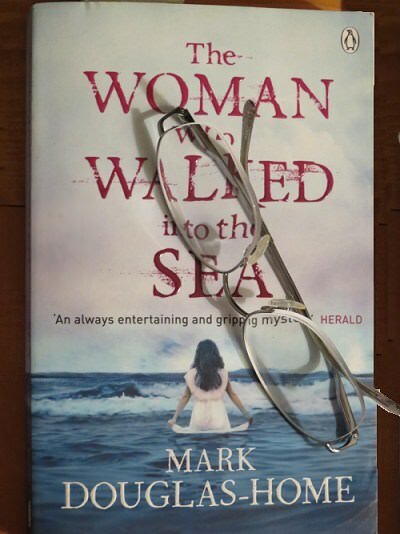 Both the books by Mark Douglas-Home are well written and very enjoyable.. This goes on the recommended list, and no I am not saying more for a review than Amazon did!.